After a hitless game in the 18-inning marathon on Saturday night, Bryce Harper woke up in San Francisco yesterday and decided he was coming to the park to send this to a game four. Harper had an absolutely huge game, making two great defensive catches with the game on the line, drawing a walk that started the rally, and hitting of course his monstrous home run which was his third of his postseason. 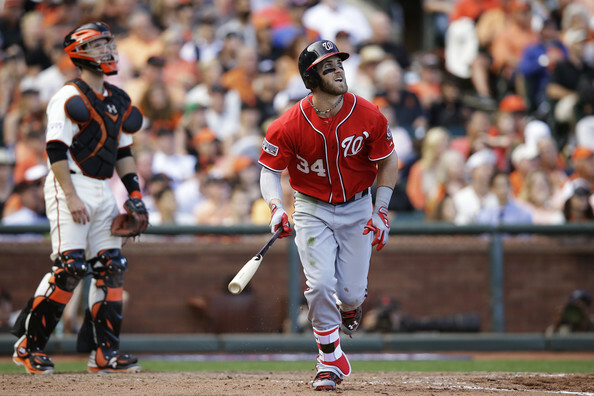 To take a quote from Brandon Belt – that’s probably one of the hardest balls Harper has hit. You have to love lowly Jean Machi pointing in the air for the ball to assist his outfielder as it heads toward McCovey Cove. Yeah, Jean. He’s got no chance for this. So the Nationals live to fight at least one more day, 4-1. They survived Madison Bumgarner and one has to wonder if this series has swung and the Nationals have enough left in the tank to get it back to Washington. One thing is for sure – nothing gives the Nats a shot in the arm like a monster Harper bomb. ← Previous Story So yeah, that sucked.